When visiting NYC, people tend to focus a lot of their attention on Manhattan. The island itself is huge and holds many little wonders that even I have not ventured over to. The focus many tourists (and even locals) have on Manhattan leaves the nearby boroughs feeling a little neglected. Long Island City is a hop skimp and jump away from Manhattan and what once was an industrial wasteland is now home to high rises, lofts and condominiums. And along with its booming real estate and growing population, lies a quaint and reliable French Bistro that has been a favorite of mine for years. Tournesol, literally means Sunflower, it’s a very simple flower that can brighten any space. And like the sunflower, tournesol is a cozy and unassuming space that has the ability to brighten any evening. The little French Bistro is cozy which is a nice way of saying small. Typical in NY is the sardine effect in dining. I admire people who can sit right on top of someone and completely drown out the person next to them. I, on the other hand, hate this. So, when I dine out, I always go when dinner service has just begun; around 6pm. Depending on the evening, you can walk into Tournesol and get a table. With it being a Bistro, a lot of the French staples alternate on the menu in the form of specials. 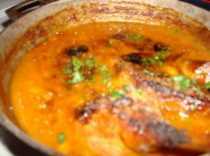 But the tried and true dishes are not to be missed. Quality. French food is an indulgence. 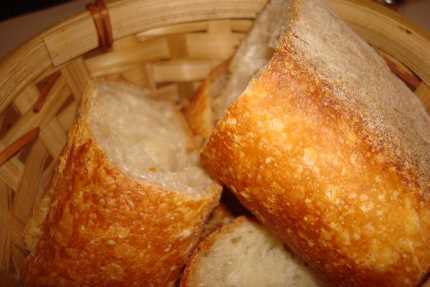 If you are dining out on French food regularly, eventually all the butter will catch up to you. 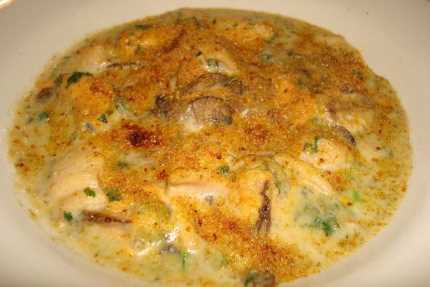 Tournesol features quality dishes that make for a great special occasion. Price. French food is typically expensive. Dining here is a five star experience but with 3 star pricing. Most expensive dish is around $25. Service. I love the staff. When I was new to French cuisine, they were patient with me when I had questions about ingredients and flavors. And were honest when I asked them their opinion. Laugh with your servers. It’s awesome. If you can forgive those cons for a great night out, here are some of my favorite things at Tournesol! 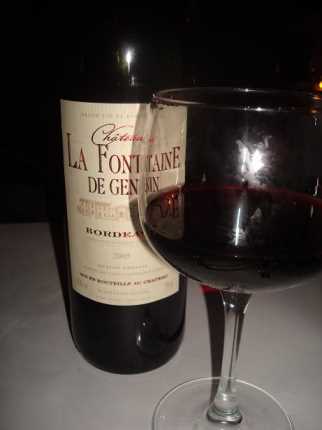 A full bodied French wine, like a Bordeaux is a must when dining French. They have a great selection of wines and if you are unsure of what to order, talk to you servers! They know their stuff! 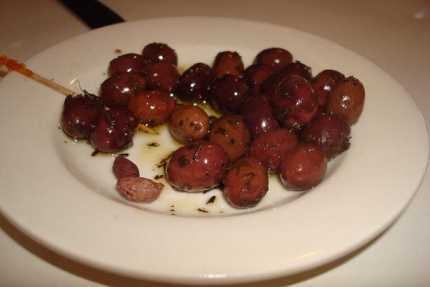 I am a huge fan of the briny olives covered in oil. And skipping the bread basket is optional. Unless you are a carb junkie like I am. I normally want to save room for my entrée when dining on French Cuisine but because the event itself is rare, I go big or I go home. The appetizers are rich. But they are sinful. If you feel that guilty, you should share. It would be a sin not to have a taste. Mussels in Béarnaise sauce. Béarnaise sauce is a thick and creamy sauce made by emulsifying egg yolks and butter with some lemon and tarragon. It’s a lot like Hollandaise except it is made with tarragon. And it’s totally delicious. 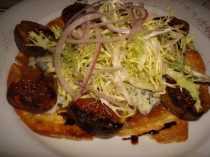 Figs with blue cheese and frisse. An amazing balance of sweet and savory. The bitter frisse compliments the very sweet figs and the creamy saltiness of the blue cheese. This feels like the lighter of choices with regards to richness in French food. They tend to have something for everyone. Regular menu items like roasted salmon and NY Strip steaks are in rotation. 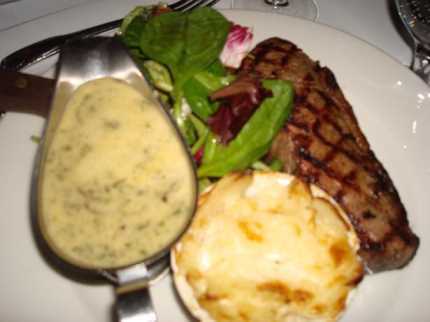 The New York strip is a hefty dish with a thick NY strip with a side of potatoes and what seems like a bucket of béarnaise sauce. For me, it’s all about the specials. Now that summer is on its way to being over, I have some favorites to keep in mind for when it gets colder out. And my all time favorite. 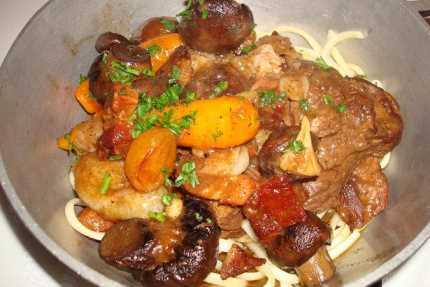 So much so that I have recreated this dish for my family on several occasions, Bouef Bourguignon. A beef stew. This beef stew features beef that is seared in bacon drippings and butter, then soaked with an entire bottle of Bordeaux and pearl onions and carrots that have softened in bacon fat. Hearty, right? The beef is supple and tender. It falls apart at the mere suggestion of a bite. And sits on top of a bed of egg noodles. This dish is the bees knees for me. And I have been crazy enough to order it in the summer. But its so good, I am willing to sit in my own sweat to enjoy it. 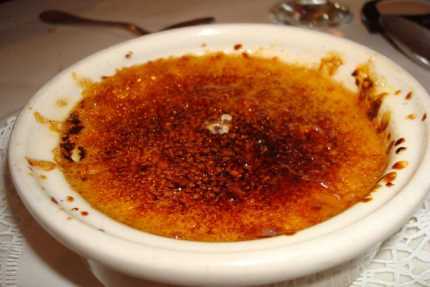 When you are rubbing your belly from the deliciousness and still have room for more, the cream brulée is a true delight. The vanilla custard dessert that is topped with sugar which gets caramelized, tastes light despite being comprised of egg yolks and cream. The caramel crust on top and the specs of vanilla bean in the pudding are proof of the love that is poured into every ramekin. It is the end all and be all of French Bistros for me at Tournesol. A restaurant I love and respect. A neighborhood gem. A Long Island City Establishment. So, if you are in the city of New York and looking to hit up the outskirts for something not in your tour book, Hop on the 7 train for 2 stops to Vernon Blvd. Because Now, it’s on your radar.